Synopsis For too long bowls was thought of as a game for those with time on their hands - a pastime for retired gentlefolk. There is no doubt that since the sport was 'discovered' by television, it has become a game for everyone. Tony Allcock depicts this perfectly: a young man, rich in talent, with the ability to demonstrate on video the methods and techniques that have led to his phenomenal success. In this production Tony emphasises that, above all, bowls is a simple game, and he shows how skills and equipment have developed over the years. Many types of stance are explored in detail, in a manner only possible through the medium of video. The grip, swing and follow-through are appraised, and Tony discloses his methods to the viewer. Tony is joined by his international colleague and fellow World Team Gold Medallist Wynne Richards, whose unique approach to the game is discussed, stressing the importance of a comfortable stance. 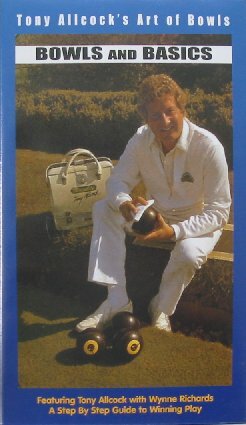 This title was also made available as a 2 in 1 programme with Bowling the Jack through David Finch Distribution Ltd, recommended retail price £12.99.